Maldonado, L. Working Group 4: Spatial visions of urban agriculture. 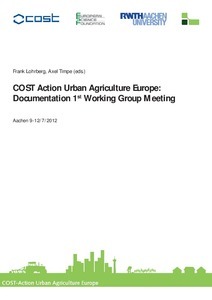 A: COST Action TD 1106 Urban Agriculture Europe. "COST Action Urban Agriculture Europe: Documentation of 1st Working Group Meeting". Aachen: 2012, p. 37-41.